The frothy whitecaps of the Pacific, towering coastal redwoods, cellar-worthy wines and the most heady, emerald nugs in the world. To the perception of tourists, wine and weed might hail from the same breadbasket. But for Cali natives and those working “in the industry,” the worlds of wine and weed couldn’t be more disparate. Geographically, 200 miles connect Napa to Garberville — the heart of Humboldt County’s robust marijuana industry — but culturally speaking, the two farm towns have little in common. The passage of Prop 64 has changed everything. No longer stepsiblings pretending they’re not related, wine and weed are looking at each other with a new appreciation. Since the 2016 election, it’s been a countdown until marijuana’s shady days of prohibition are buried in California’s agricultural history (and hopefully made into film starring Tom Hardy). With cannabis’s newly minted, almost-legal status, consumption is rapidly infiltrating new cultural spaces and attracting demographically diverse consumers. In 2018, the legislative shoestrings of Prop 64 will untangle to allow recreational cannabis to hit the retail market (if a mountain of red tape is overcome before January). Undoubtedly, this culturally historic moment will permanently transform the agricultural landscape of the Golden State. With over half a million acres planted to viticulture, California’s world-famous vineyards are valued at 5 billion dollars. How will the wine industry be impacted by the mounting green tide of cannabis, already valued at a whopping 7 billion dollars? 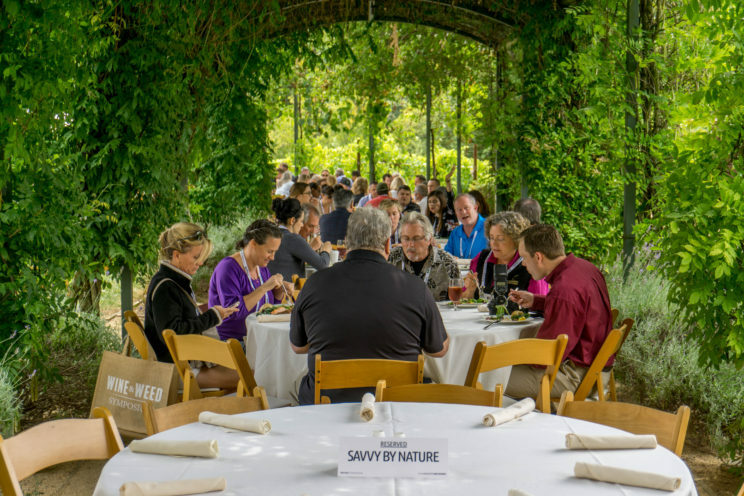 To begin grappling with this question, nearly 500 participants, including winemakers, cannabis farmers, lobbyists, sommeliers and California Senator Mike McGuire, gathered at the first annual Wine and Weed Symposium in Santa Rosa on August 3rd. Hosted by the Wine Industry Network, the event was launched as a networking and educational platform for the wine and cannabis industries to prepare for the agricultural convergence in California’s forecast. “There will be much more collaboration than most anticipate, as cannabis will be added to an already robust tourism based economy,” says Sam Edwards, a civil engineer who founded the Sonoma Cannabis Company in 2015. Edwards, a Sonoma County native, is archetypal of the new cannabis cultivator. His company sells artistic, ethereal packages containing concentrated cannabis extracts, each uniquely marketed to “Inspire,” “Awaken,” “Relax,” or “Slumber.” Pen and ink drawings of forest animals grace each box and a beautifully styled website describes their company as “a small place at the end of dusty lane, where songbirds wake us every morning and crickets serenade us to sleep at night.” Sounds wonderfully restorative and charming, doesn’t it? It sounds like a winery. If we drew a Venn diagram of wine and weed, many words fall left and right of center into isolated circles. Society interprets a glass of wine as a prestige accessory. In stark opposition to the damage done to a pot smoker’s reputation, wine elevates social capital. And no one asks whether a bottle of wine served at an afternoon PTA meeting is medicinal or recreational. The sophistication and style associated with wine are words that ganjapreneurs, like Edwards, want to see in weed’s Venn diagram. A keynote speaker at the Wine and Weed Symposium, Edwards believes in the potential of an environmentally conscious cannabis economy that buttresses California’s wine industry. Citing statistics from Oregon and Colorado, Edwards argues that professional and permitted cannabis businesses will build the agritourism economy in California. Integrating the many peripheral businesses that are tangential to cultivation, the legal cannabis industry will demand the services of engineers, accountants and attorneys. A wine industry leader in digital marketing and fellow cannabis advocate, Rick Bakas, has successfully branded many of Sonoma County’s premium wine labels. His recent projects include Weedhorn, a cannabis education site, and ABBI, “the world’s first artificial intelligence medical marijuana chatbot.” At the symposium, Bakas spoke about how cannabis businesses can learn from the wine industry’s best practices. As the cannabis industry steps out of the prohibition era, many veteran growers fear the industrialization of weed, anticipating “mega-grows,” setting up shop where land is cheap and water is plentiful. Undoubtedly, corporate scale has drastically impacted California’s wine industry; if the state were a country, California would be the world’s fourth largest wine producer. Conversely, over 70 percent of the cannabis sold in America is grown on California soil – the industries face similar challenges in maintaining quality, while being stewards to the land and competing for water. Responding to the boom and bust fears of legalization, many speakers at the symposium focused on how small cannabis farmers can model themselves after boutique winemakers. By utilizing best practices from the wine industry (like direct to consumer marketing), many believe that cannabis cultivators will be able to successfully market niche and artisan cannabis products in the legal marketplace. The first annual Wine and Weed Symposium left participants feeling hopeful about a fruitful collaboration of California’s historic wine industry and the new cannabis economy. Without a doubt, the future of California’s agricultural landscape depends on it.